Today, we're sandwiched between two incredibly important dates in the life of Gene Autry.... the date of his birth (September 29th), and the date of his death (October 2nd). He was born in 1907 and died in 1998. 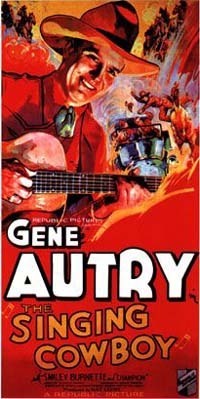 When I was a boy, like thousands of others, Gene Autry was my hero. When I was no more than 9 or 10, my parents took me to see Gene Autry and his Wonder Horse Champion live at the Bell Auditorium in Augusta. When he came on stage in his white suit and hat, it was a truly magical experience for me. I even told my friends that Mr. Autry was staying with us, at our house. As I recall, a few of them actually believed me. And now, here I am again, telling of my connection to Gene Autry.... but this time it's true. I got to know Gene and his wife Jackie after he did my talk show Miller & Company in 1984. Jackie told me years later that it was one of Gene's favorite interviews, and he would watch it from time to time. For me, no Emmy or Oscar could have topped knowing that. Our paths crossed on several occasions during the time I was living in California from 1986 until 1992. And it never stopped being magical for me. But my favorite encounter with Gene Autry came in 1994. I had already moved back to Nashville, but flew to Los Angeles to be with my pal Pat Sajak when he got his star on the Hollywood Walk of Fame. After the festivities, a reception was held at the Roosevelt Hotel where, among the guests, were Gene and Jackie Autry. They were serving wine and champagne at the reception, and while chatting with Jackie, she mentioned that Gene didn't like wine.... even at 86, he preferred vodka. Eager to please, I hurried to the bar and fetched Gene a straight vodka, with a twist, and brought it to him. He invited me to sit..... so there I sat with Gene Autry and his wife..... just the three of us, discussing, even singing, his old songs. Gene was fascinated that I knew the lyrics to some of his more obscure recordings, such as "I Want To Be Sure", "It Makes No Difference Now", "Don't Live A Lie" and "Riding Down the Canyon". In fact, I was treated to a story about how he and Smiley Burnette had written "Riding Down the Canyon" while visiting the Grand Canyon back in the late 1930's. I'm sure there were other things going on at that reception that day.... but not for me. I was with my hero, singing his songs, and at that moment, things just couldn't have gotten any better. Has always been my guy and Roy also. But you don't see meany movies on TV much I like to see more on TV. I would like to see more cowboys movies on TV, they should have a place on TV to old Cowboy's movies. I am's 66 year's old and still watch them on TV and I have some DVD and DVS also that I play them. You never get to old to watch them's and I let's some of friends borrow so they can enjoy them too.